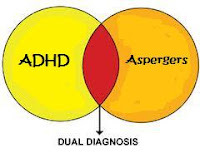 The symptoms of Attention Deficit Hyperactivity Disorder (ADHD) and High-Functioning Autism (HFA) - as well as Asperger's - do mimic one another, and there are some connections between ADHD and HFA. In fact, there are dual diagnoses of ADHD and HFA in many cases. Both of these diagnoses are developmental disorders. They share many of the same behavioral features and both affect children in the areas of behavior, communication, and social interaction. As a result, there is often some confusion as to which disorder is present. Medical, mental health and educational professionals need to be trained to differentiate between the disorders and diagnose the correct one. • Anonymous said... Very helpful. • Anonymous said... Aspergers is like living in a black and white world. There is no grey area for these kids. It is or it is not and it's hard to reason with them. My son is 8 and has ADHD, aniexty disorder and aspergers. His meltdowns are few as long as we keep a very strick schedule. The school is actually easier then the summer. My son had a melt down at his diving practice the other day when another boy came in and cut him in line. At this age it should get you a little mad but not a tantrum. They can fixate on a topic and won't let it go. My son had an argument with his teacher last year over one thousand and him saying 10 hundred is short for a thousand. • Anonymous said... My son was diagnosed with adhd last week. They also said he's right on the edge of being in the autism spectrum. They suspect high functioning and aspergers but because it was so close he was only diagnosed with adhd right now. He's 5. • Anonymous said... Thank you for posting this! My child was diagnosed with ADHD in 1st grade. Last year (4th grade) her resource teacher started questioning Aspergers as well. We will begin testing in 5th grade. • Anonymous said… I had the same thing with my child's school. Was a Tough battle because.....how do they put it..." we are experienced..." as if we as mothers are so uneducated and don't know our kids you know. Very frustrating. • Anonymous said… I have a grandson with ADHD and one with autism. Many similarities. • Anonymous said… I think people only react that way to medication because it's being used more often than not, as "the easy way out" to deal with "difficult" children. • Anonymous said… I'm wondering how many children have both? We're in the beginnings of getting a diagnosis. They told us adhd vs asd or both. Like other parents, he can sit for hours and read a book, build with Legos and has no problem with attention span when it is something he desires to do or learn. Any input is appreciated. We are 5 months out from our official multidisciplinary evaluation to give us answers. As a nurse, I suspect my nephew has both. Unfortunately, he suffered significant trauma, neglect and abuse and we have been chasing that rabbit down the hole for a long time. • Anonymous said… It is important to get the right diagnosis because the education programs implemented in IEPs for ADHD are different than what can be included in ASD educational modification plans. • Anonymous said… It took from kindergarten to the end of second grade to get his diagnosis from the school psychiatrist. He was tested for ADHD, language reception, IQ, gifted, etc...all first. If they had just listened to me and tested for ASD at the start he wouldn't have fallen behind Thankfully during that time he had teachers who went above and beyond to accomodate him as best they could until he got an IEP and his third grade teachers got him caught up very quickly. • Anonymous said… My dd20 has both and takes meds. I'm offended when people get on their high horse about medication. Some people would not function without them! • Anonymous said… My son has Aspergers and a diagnosis of ADHD. My daughter also Aspergers, no formal diagnosis of ADHD but it is present. • Anonymous said… My son is both too- and yes they do cross over and I wondered exactly the same as you. • Anonymous said… My son is both. ADD diagnosed first. Yes they crosssover. • Anonymous said… Personally I think many cases of ADHD are misdiagnosed and are really Aspergers. It's the first thing a school suggests and many parents do not delve any deeper. I knew my son was not ADHD as he could sit for hours focused on a single thing [among other symptoms]. I mentioned when they brought up attention deficit testing that I thought he had a touch of autism and pushed the evaluation in that direction, which greatly displeased the school counselor because she thought otherwise and was all about meds. • Anonymous said… Possible to have both. My son does. Sophisticated educational testing which I paid for and evaluation which the school district paid for got to the bottom of it all. • Anonymous said… These symptoms do go along with autism much of the time, but I personally think ADHD is over-diagnosed. It's easy to slap that diagnosis on someone who presents with hyperactivity and inattention, but these are often symptoms, rather than an actual diagnosis. For example, hyperactivity and inattention often go along with sensory processing disorder, and SPD affects at least 75% of people with autism. The treatment for ADHD is medication, whereas the treatment for SPD is occupational therapy. Since SPD is prevalent in kids with autism and the treatment differs from that of ADHD, it's important to determine the root of these symptoms in order to correctly treat them. • Anonymous said… Yes and since the upping of toxins into developing babies/brains, a big explosion in both and the severity. Follow the stats. People didn't believe in ADHD either unfortunately. Then they just over prescribed drugs, none of this natural (the numbers, drugs or directly injected neurotoxins). Yuck.